San Jose, Costa Rica, August 19th, 2018 .- The Superior Share casino group continues to increase its international presence in response to the constant growth of online casino players in Latin America and other Spanish-speaking markets. With this in mind, and just as Superior Casino has done for many years, 24VIP Casino announces its new version in Spanish for all Spanish Speakers in the world. 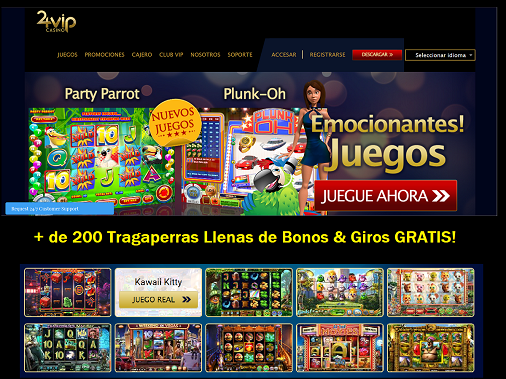 Spanish-speaking online casino players can now access all areas of 24VIP Casino in Spanish including games, promotions, banking, VIP club and more. The player can also make his banking transactions based on the currency of his country. 24VIP Casino accepts payments in American Dollars, Australian Dollars, Euros, Sterling Pounds, Rands and also bitcoins. The casino games are also available on the basis of the currency that the player selects when he/she registers for an account at 24VIP Casino. 24VIP Casino was launched in 2017 by veterans in the industry with a combined experience of more than 40 years in online casinos, in all areas such as operations, marketing, customer service and technology. 24VIP Casino has the technology of the company RIVAL GAMING to provide online casino games. It also has a full range of 3D casino games developed by BetSoft. Finally, the player can also play table games with live casino dealers through ViVo Gaming. The range of games that 24VIP Casino offers includes more than 200 slots, including 3D games, bonus round, video slots, I-Slots and classic 3-lane slots. Also, table games like blackjack, craps, roulette and baccarat. When a player registers with 24VIP Casino for the first time he/she can receive up to $ 1000 as a welcome bonus to play in any slot game. Then, they will receive up to 240 bonus rounds free of charge as a way to thank them for their registration. 24VIPCasino was designed to provide an exciting, satisfying and safe environment, and to meet the changing needs of this generation of online gambling. SuperiorShare invites online casino affiliates to sign up for our affiliate program and be able to promote Superior and 24VIP Casino within the Hispanic market. Our affiliate program offers up to 45% commissions on the life-time of a player, monthly payments via UpayCard, Neteller, Skrill and Ecocard and access to real-time statistics and assistance of a personal affiliate manager.